I have been asked by Deb at http://www.htheblog.wordpress.com, http://www.islandhomeblog.wordpress.com, http://www.debrahunter.wordpress.com to continue the “Blog Hop Around the World”. Deb is a blogger who is multi talented in many different areas such as photography, knitting, yarn dying with nature, makes wood buttons and many more unique items. Check out her various blogs to see more of what this wonderful Artist does, it will inspire you. The “Blog Hop Around the World” is a wonderful collection of amazing bloggers with great talents of all sorts joining in to tell you more about what they do. A great way to see more of the many bloggers exerts is to google “Blog Hop Around the World”. I am always working on something new and the best way to see my latest and most current work is on my Etsy store at http://www.valeriebaberdesigns.etsy.com I am inspired by many different things and often will incorporate that into my unique designs. I recently started a new collection with an Architectural flair. For years I have been inspired by the amazing Architecture of the past. While taking my Interior Decorating and Interior Design the one group of courses I couldn’t get enough of were Art and Architectural History. The fact that one building can take various decades and more to complete with various architects, designers, painters and the many people it takes to achieve these greatly detailed features of the architectural buildings of the past. I could go on and on about this subject, but it would take a life time to talk about it all. The Stained Glass Rose Window Scarf is one of my newest designs in my Architectural Collection. I adore vintage buildings and the amazing and exquisite architecture of the past. Stained Glass windows have always caught my attention in these beautiful buildings of the past and current. Perhaps that is why about 10 years ago I took classes on Stained Glass and made various pieces for my home. The time, skill and artistry that goes into designing and making one small window is an enormous task, but worth every moment when you see the light dancing through the wonderful colours of the pattern. I have been thinking of designing a knitted version of Stained Glass for a while now and this is one of my first tries. Gothic Architecture incorporates many stained glass windows as the flying buttresses used in design made it possible to have many more windows than previous architecture design. I believe this is a big reason why I love this Architecture so very much. A stained glass window has two sides with different effects on each of them. Tracery and elaborate stone features were an exquisite feature of these beautiful works of art. This design is made with a stone coloured base of grey or beige and neutrals in a hand painted merino wool. The Floral Stone Tracery Scarf is made with a stone wall essence on the base of the scarf in the colours of various stones. The inspiration for this set of scarves is the amazing stone tracery on Architecture of the past. The elaborate and fascinating artwork that was involved in designing and making the stone tracery is outstanding. For these smaller scarves, more of a cowl size, I have chosen to put a few stone tracey flowers to accent the design. I will be changing the stone tracery as I go along focusing on different types of stone tracery. This is just the beginning of my Architectural collection I have some larger pieces working in my mind I must start designing soon. I have recently began adding some knitting patterns to my work. Valerie Baber Designs are unique in many ways from the colour, accents and yarn types. All pieces involved in my designs, excluding things like buttons, are all handmade and designed by myself. I use many different yarns and add the unique touch with embellishments and styles of the accessories. 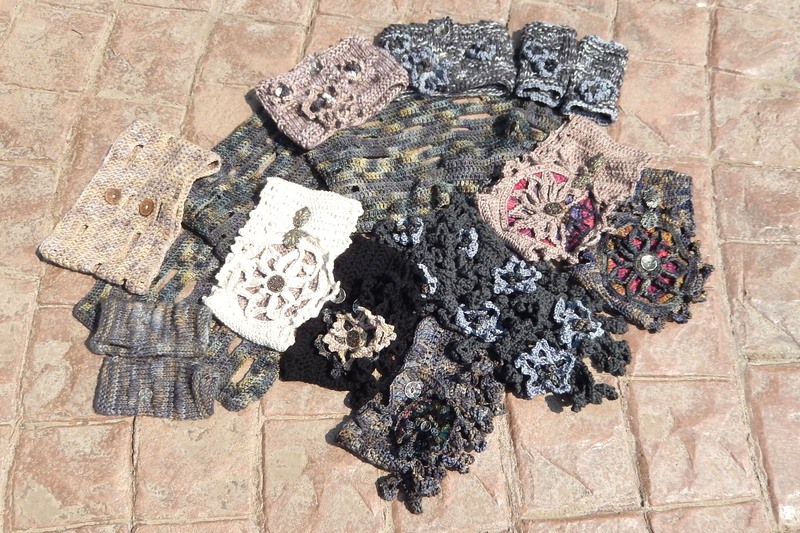 The Accessories include Scarves, Shawls, Sweaters, Fingerless Gloves, Mittens, Hats and other specialty items. High end yarns such as Hand Painted yarns, Merino Wool, Alpaca, Llama, Hand Spun Yarns, Silk, Cashmere, Organic Cotton, Cotton, Linen, Bamboo are used. 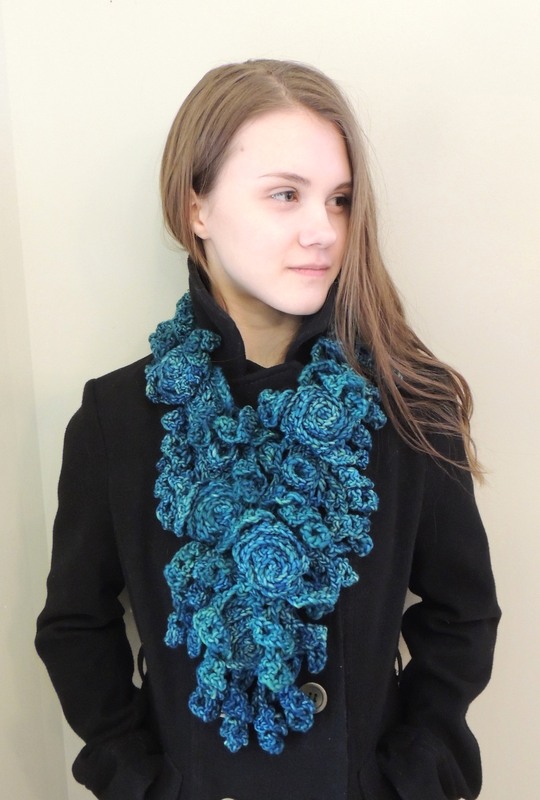 A combination of both knitting and crochet complete these pieces. Many of my designs are one of a kind and I do specialty work for other companies such as the Alberta Craft Council, Art Gallery of St. Albert, the Opera Art Project and more. Many of my designs come from various inspirations including nature and man made alike. To keep my designs unique I designed everything by myself, I do not use other peoples patterns in my work. I love the challenge of making something new and just taking some yarn and needles and working away to see what comes from within that day. It is very freeing to design this way. I never have enough time to design everything I am inspired by. This is an interesting question. I was previously in the ready to wear and knitting pattern end years ago, but a hand injury took me out for over a year. During that time I decided to go back to school and get my Interior Decorating Diploma and then proceeded to my Interior Design Degree. However, in the middle of my Interior Design degree I ended up with a terrible back and hip injury that made it impossible to finish. My sister asked me to make some scarves and after taking a recent free form knitting class off I went in a direction I had never been before. This is why much of my work is embellished. It opened up a creativity I had never felt before, designs just came flowing out of me and thankfully continue today. My work is completely different than my past business which was more traditional with designing with cables, intarsia and fair isle styles of knitting, mostly for kids. This more free form approach to designing has opened up a creativity I have never experienced before. I believe my school in Interior Decorating and Design has definitely helped my in this venture, especially the Architectural Collection. My knitting passion started with a homespun knitwear business, called “Hey, Diddle Diddle. Progressing from designing and knitting ready to wear children’s hats, sweaters and woman’s wear to the knitting world. Writing and designed patterns for my own line of designs and for the knitting magazine “Cast On”. Most of my creativity comes from things around me such as nature, colours, shapes, people and anything that catches my eye inspiring me to create. The texture, colour, feel and quality of Natural Yarns and Pure Fibres are my favourite to use in my unique designs. As I continue to grow and expand my artistic business my designs will continue to change and evolve into new and creative exciting pieces. It has been a pleasure to be part of the “blog hop around the world”. I am passing the baton to Leah at http://seattlespinner.com/ Leah spins the most wonderful yarns and then makes such lovely designs perfect for her yarn. She uses some of the profits to help others with the woman of http://awamaki.org/ Her inspiration comes from nature and more and you can definitely see that in your beautiful yarns. She will be doing the next “Blog Hop Around the World” so check her blog out soon. Great post. It was fantastic seeing pictures of all your various work together. Do you have pieces at the Art Gallery of St. Albert all the time? I’d love to see it in person. I will keep the market in mind. We sometimes go into St. Albert from the cabin as there is a great board game store there. Actually I will clarify, my husband and kids go in the game store while I knit in the peace and quiet. I might also be able to combine it with a walk at Big Lake or Wagner. It would be cool to meet each other. Absolutely pop by. My booth changes every week. They are noted on my website or just check around the market or ask at information by the Library. http://www.vbaberdesigns.com Have a fabulous week. We actually had plans to go last weekend, but then we discovered the rotted floor in the cabin and “plans changed” (big time! ).